Join AIAS BAC for a tour of Gensler's Boston office! This event is free and open to all current BAC students. In order to attend, you must RSVP online at http://aiasbac-gensler.eventbrite.com before Wednesday, January 29. 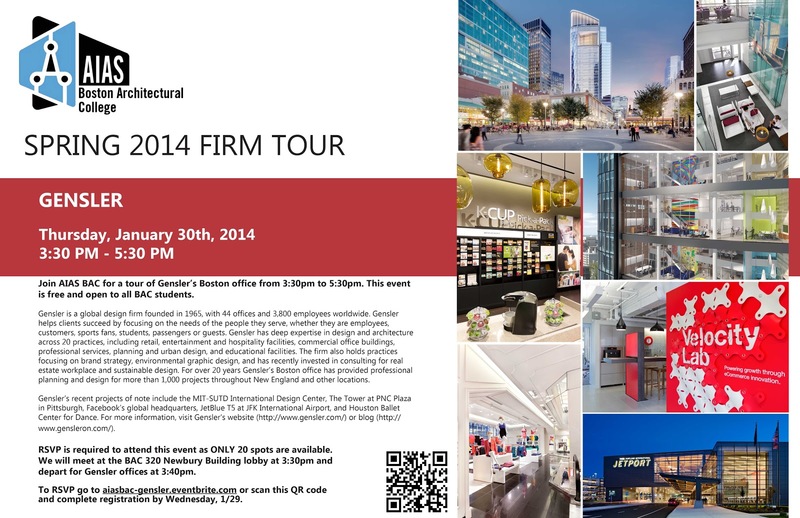 If you have any questions about the firm tour, please email aias@the-bac.edu. Gensler is a global design firm founded in 1965, with 44 offices and 3,800 employees worldwide. Gensler helps clients succeed by focusing on the needs of the people they serve, whether they are employees, customers, sports fans, students, passengers or guests. Gensler has deep expertise in design and architecture across 20 practices, including retail, entertainment and hospitality facilities, commercial office buildings, professional services, planning and urban design, and educational facilities. Gensler's recent projects of note include the MIT-SUTD International Design Center, The Tower at PNC Plaza in Pittsburgh, Facebook's global headquarters, JetBlue T5 at JFK International Airport, and Houston Ballet Center for Dance. For more information on Gensler, visit their website or blog.